It takes up an entire block on President Street, yet I’m willing to wager big money very few of you have been inside. Of course I’m not that much better having only been there myself three times since since it opened in June of 2005. I’m speaking about the Reginald F. Lewis Museum of Maryland African American History and Culture. It was of course named after Reginald Lewis, a Baltimore born entrepreneur and philanthropist. It has over 82,000 square feet and of that over 13,000 is permanent and temporary exhibition space, a two story theatre, resource center, gift shop, cafe, classrooms and a lobby reception area. Their press material makes clear the reasons for it being built. Among them are providing an important venue to share Maryland’s African American history and to provide educational programs for both children and adults. In all, there are three permanent galleries on the third floor and on the second floor there’s an exhibition that highlights African American stories from various regions in the U.S. The museum is open Wednesday-Sunday. Admission is $6.00 to $8.00. Reach them at 443-263-1800 or go to lewismuseum.org. And the building looks great there on President Street. OK, our cultural visit is done for the day, time now for a meal. For that let’s go to Canton, to the intersection of Hudson and Linwood, and stop by Lee’s Pint & Shell. It opened in October of 2016. 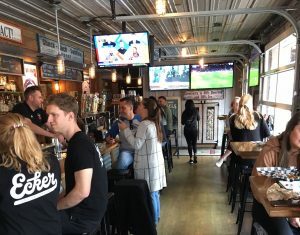 It is open Monday-Thursday from 4 to 2 am, Friday and Saturday from 11 to 2 a.m. and Sunday from 10 to 2 am with Happy Hours weekdays from 4 to 7 p.m. There are no entrees per se. 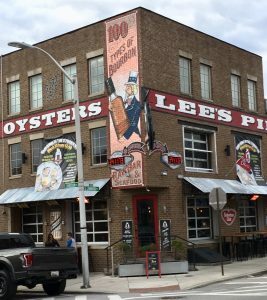 Basically the menu consists of sandwiches, pizza, salad, appetizers, tacos, soup and quesadillas.Every Sunday from 5 to 9 p.m. there’s the Lee’s Lobster Supper ($14.95 for a pound and a half with two sides) and they certainly sell a lot of oysters. I mean a lot of oysters. I was told about 3,000 per week. There’s seating for about 120 downstairs and another 85 or so upstairs. In the warmer months there are eight outside tables. In the summer they also roll the windows up so the warm air can drift inside. Menu favorites include the roasted brussels sprouts appetizer, the hickory smoked wings, pulled duck nachos and the double cheese burger. All sauces are made in house, there are weekly drink specials and Wednesday from 4 to 7 half off bottled wine. You can also select from over 100 bourbons and many draft beers. The menu will change a bit as the seasons change. For you sport fans there are 22 TV’s scattered about. And ask about The Whiskey Club. Reach them at 410-327-2883 or go to leespintshell.com. Make a note of March 30. From noon to 10 pm it’s an outside event called Shucking in the Street. Featuring live music under a tent and free oysters shucked all day.